There have been times in my life when I needed the future to survive the present; when the answers to my questions were obscured. I clung to the hope of a brighter tomorrow to shine its light into my darkest nights. While the sentiments that I felt were very much my own, I believe that most people have similar emotions at some time in their life. Poets and prophets since the beginning of time have offered us words of hopefulness to help ease the burdens of living. In case you think I’m taking you down a road of doom and gloom here, don’t worry this isn’t the evening news! It’s simply that drifting on vast blue water gives me plenty of time to reminisce and reconcile, muse and mend, and ultimately to recognize where I’ve been and appreciate where I am now. I often find myself surprised by this newfound freedom and weightlessness of life. It would be easy to say that it’s simply the result of sailing on an empty sea with few responsibilities and no schedule, but I would offer that it’s more than that. The truth is that I’m changed. Rather than living for the future, I find that the future is now, and the present is truly a gift. Being aware of every moment alters the importance of seemingly insignificant events. Dolphins flashing silver on the water are to savor, new vistas while turning at anchor give fresh details to enjoy, and a smile shared is a moment to remember. Time moves slowly and minutes are uncluttered, allowing for life to be lived to the fullest. Shafts of light to the darkest depths below. A rippling song as we move along. Extravagance in a simple existence. Freeing the sails that lead us on. Silver reflections on a black sea. The past two weeks since leaving San Carlos have been perfect in every way. It’s as though the Sea of Cortez has finally welcomed us and is showing us just how magical she can be! 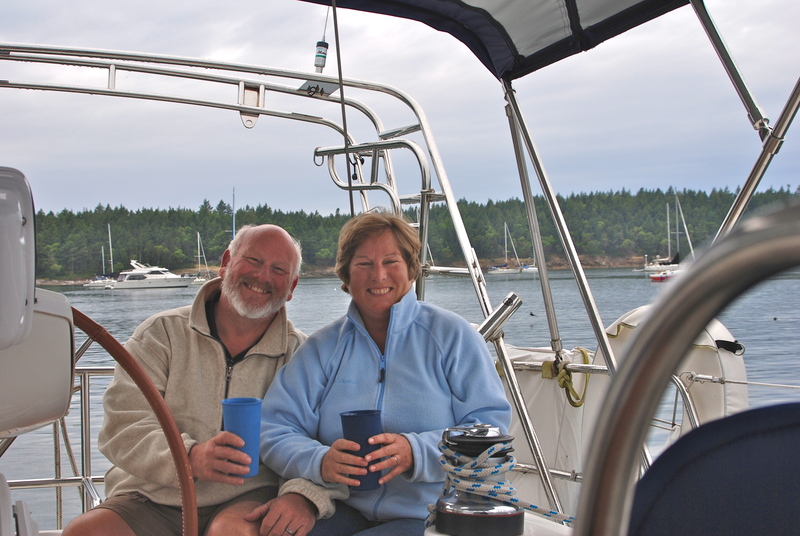 We’ve had wind to fill our sails, calm nights and cool breezes, crystal clear water in scenic bays, and quiet anchorages that haven’t yet filled with the season’s visitors. The last four days we’ve been in Caleta Partida, one of our favorite anchorages from previous visits to the Espiritu Santo islands. It’s actually a bay created from an extinct volcano that separates two islands that are less than a mile apart. The crater itself is very shallow and filled with white sand that creates the most beautiful aquamarine color. Birds dive for the schools of little fish that swim there, and the turtles roam around, showing their heads every now and then when they come up for a breath. The reef nearby is a circus of colorful fish, and the red cliffs above are full of interesting caves and rock formations created by the wind and waves. It’s completely silent at night and the stars reflect in the mirror created by the calm water. We’ll be sad to leave the Sea of Cortez but we can’t think of a better send off than what she has shown us these past couple of weeks. After running south last winter to avoid the seasonal North winds, and then hunkering down to avoid the summer heat and the hurricanes, it’s been a real delight to finally unwind and fully experience the beauty of the Sea. The future is the present and this present has been an awesome gift! Sounds like you are in a constant state of blissful meditation as you glide through nature’s best. Your words hit home for me as I get back on my own daily hamster wheel – barely award of life passing by. You rekindled some faded dreams – and the realization that life gives me so much more than I realize are within reach every day. They might not be as exotic as yours, but they are worth stopping for moments of being ‘present’. As always, your writing is beautiful! Hi Geoff! Thanks for your note. We are feeling pretty darn lucky to be living the life…it’s amazing. Our long term plans are to keep heading south along Mexico, Costa Rica, Panama, through the canal in a year or so, San Blas islands, more Panama, Caribbean, etc etc….we’ll see which way the winds blow! !